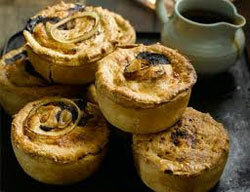 Expat Gerry O'Donnell has brought a slice of English life to Japan, with his popular shop Jerry's Pies. Moving to Japan in 1992 to teach English, Gerry decided to stay in Japan permanently following the end of a relationship with his then girlfriend. Distraught by the complete lack of pies in Japan, Gerry began making pies for himself and work colleagues at his home in Arashiyama. Word of his delicious pies spread amongst his friends and eventually he was convinced to try and sell the pies on to local cafés and restaurants. Interest came instantly, a local restaurant asked for two large vegetable pies per week and soon English-themed pubs throughout Japan were ordering Gerry's pies. Eventually Gerry was making enough money to convince him a shop was needed, and he subsequently opened Jerry's Pies, spelling the name differently to accommodate the Japanese pronunciation of the letter G.
Since pies were pretty much unheard of prior to Gerry's store novelty value alone was enough to get the customers in, with both savoury and sweet pies captivating the taste buds of his customers.